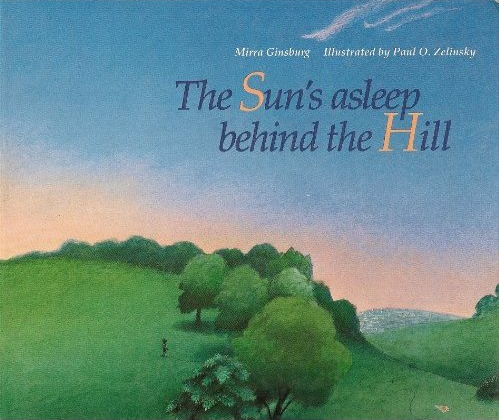 In 1982 Mirra Ginsburg adapted an Armenian song into a beautiful bedtime picture book. “The Sun’s Asleep Behind the Hill” reads like a lullaby, describing the arrival of a peaceful evening as it’s greeted by the creatures around the world. Simple words are written in bold letters – it could easily be a child’s very first book. But best of all, all the sentences rhyme! The breeze notes that the sun sleeps behind a hill, signaling “It’s time that I was still.” The leaves notice the sleeping breeze, and decide they’ll also take a rest. Soon the birds notice the resting leaves and also relax, and a nut-gathering squirrel notices the relaxing birds, and curls up in its hollow branch. Then a mother with her child notes the sleeping squirrel, and then carries home her own sleeping child. But the story holds one last surprise – one creature that discovers that all the world’s asleep. An orange moon creeps into the sky, and declares “I am alone!” The sun is asleep, the breeze is still, the bird is quiet, and the leaves sleep over the lake. Even the child is at rest, and the moon survey’s the empty landscape in a grand, silvery drawing. The real purpose of a bedtime story is to lull a child to sleep. And this book seems like it could accomplish that with both relaxing pictures and a simple story that repeats the same words – all about how it’s time to rest. The book’s cover calls it a “just-right bedtime book.” And I’d have to agree.